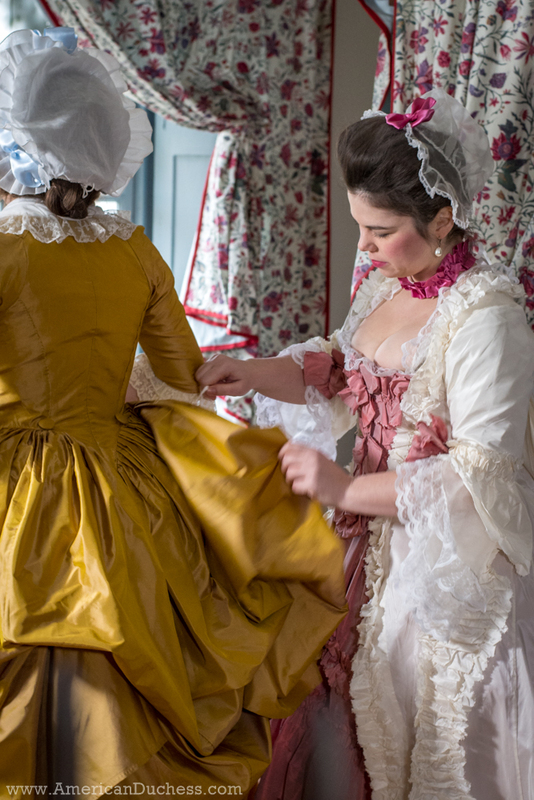 American Duchess believes in helping everyone interested in historical costume and dress history to explore the past through making and wearing their own beautiful creations. Our mission is to nurture and support this community with videos, podcasts, and blog posts on all aspects of historic dressmaking, along with patterns and how-to books for seamstresses of every level. With your contribution, you directly help us produce more of this good stuff - better quality videos and podcasts, more in-depth tutorials, and a continued series of books and patterns. We are dedicated to opening up the world of historic dress wherever information and help is needed. You may already be familiar with our historical costuming blog, American Duchess on Facebook, Instagram, or as a maker of reproduction historical shoes and accessories. We've recently also started a podcast and are now jumping in to video as a way to share projects and help others learn how to sew historic gowns. We want to offer guidance, tutorials, information, points of interest, and a creative community for everyone interested in historic dress, in any way they like to learn, be it through videos, books, patterns, podcasts, or written posts. Thank you for joining us on this journey! We hope to create amazing things with your help! Gain early access to all of our videos and podcasts several days before they're made public. Receive patreon-only goodies including PDF patterns and tutorial pages for some of the items we make in our videos (i.e. caps, bustles, hats, etc). Monthly goodies may also include shout-outs in our videos, podcasts, and blog posts; personalized greeting cards, pins, and other delights. This tier also gains early access to all of our videos and podcasts. Enjoy patreon-only videos not released to the public, along with a monthly live group Q&A directly with Lauren & Abby. Also gain access to our exclusive patron-only Facebook group. Also enjoy early release videos and exclusive monthly goodies. This tier will enjoy a private, one-on-one, 30-minute Q&A consultation every month with Lauren & Abby about anything costume and sewing related. Also gain access to our exclusive patron-only Facebook group. This tier also scores the early release content and patreon-only goodies, monthly live group Q&A, and exclusive video content. In addition to all the delightful perks of the previous tiers, Duchesses and Dukes may enjoy a pair of shoes of their choosing every year. (Must be a member for minimum 4 months). Also gain access to our exclusive patron-only Facebook group. As our big perk and thank you, sit down with Lauren & Abby for a private, limited dinner at Costume College. The dinner will take place one of the free evenings at Costume College, at an off-site restaurant in easy walking distance from the hotel. Enjoy dinner, drinks, and conversation on us! This top tier also receives all of the monthly perks of the previous tiers (exclusive content, goodies, Q&A, etc.) Also gain access to our exclusive patron-only Facebook group. *This perk happens on an annual basis. Your continued support at this level welcomes you to this private dinner every year. Printed Patterns! How cool would it be to produce our own line of printed patterns, all graded out and ready to cut and make? For this big goal we need training, software, and equipment, particularly the grading and layout software and the large-format printer.